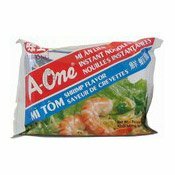 Allergy Advice: Contains Wheat, Fish, Barley, Milk, Soybean. 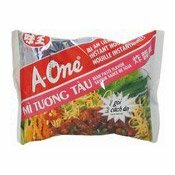 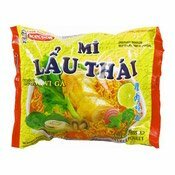 Ingredients: Noodles (82.8%): Wheat Flour, Shortening (Palm Oil, Antioxidants (Butylated Hydroxyanisole (E320), Butylated Hydroxytoluene (E321))), Starch, Salt, Sugar, Fish Extract Liquid (Stolephorus SPP), Acidity Regulators (Triphosphate (E451), Potassium Carbonate (E501), Sodium Carbonate (E500))), Flavour Enhancer (Monosodium Glutamate (E621)). 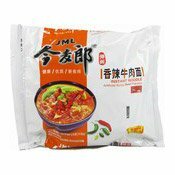 Soup (12.1%): Sugar, Salt, Spice, Flavour Enhancers (Monosodium Glutamate (E621), Disodium Inosinate (E631), Disodium Guanylate (E627)), Yeast Extract, Starch, Acidity Regulator (Citric Acid (E330)), Colours (Plain Caramel (E150a), Carotene (E160a)), Artificial Chicken Flavour (Barley, Milk) (0.1%), Soy Sauce Powder (Wheat, Soybean), Stabiliser (Guar Gum (E412)),Anti-caking Agent (Silicon Dioxide (E551)). 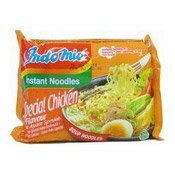 Oil (4.3%): Vegetable Oil (Palm Oil, Antioxidants (Butylated Hydroxyanisole (E320), Butylated Hydroxytoluene (E321))), Spice, Salt, Natural Lemon Flavour, Artificial Chicken Flavour (0.02%), Colour (Carotene (E160a)). 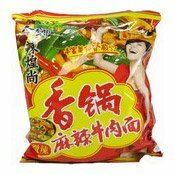 Vegetable (0.5%): Dried Spring Onion, Dried Culantro. 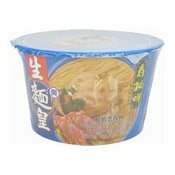 Simply enter your details below and we will send you an e-mail when “Acecook Instant Noodles Mi Lau Thai (Chicken) (雞味麵)” is back in stock!